There's only one conclusion you can draw: The Red Sox and Devil Rays are incapable of playing a normal baseball game. In last night's 7-4 win over the Devils Rays before 36,423 roaring fans at Fenway Park, you had the drama of Adam Stern's diving, game-ending catch in center field with the bases loaded. You had Tampa manager Joe Maddon's unique David Ortiz shift, which featured six players in the outfield and no infielders on the left side, a formation he dreamed up while on the stationary bike. You had Jonathan Papelbon's first tough save, as he struck out two but also walked two in loading the bases. You had the curious decision by Maddon to pitch to Manny Ramírez in the bottom of the seventh with two runners in scoring position and two outs, only to have Ramírez deliver a two-run single that gave Boston a 4-2 lead. There were none of the beanballs or brushbacks that these teams have come to be known for. There was no Tampa Bay retaliation for Joey Gathright being punched in the face by Julian Tavarez in spring training. You also had the fruits of Kevin Youkilis's hard labor this offseason: a two-run, two-out, line-drive double in the eighth inning that broke a 4-4 deadlock. 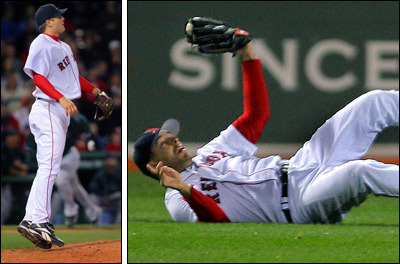 ''I'm not a role player anymore," said Youkilis. ''I'm a starter and my job is to help us win in any way possible. I don't have to go 5 for 5, but in a situation like that, to be able to get a big hit, that's huge. That's my job. That's what I'm paid to do." Mike Lowell pounced on Ruddy Lugo's first pitch of the eighth and smacked it high off the wall for a double. After pinch hitter Trot Nixon walked, Chad Orvella got Adam Stern to bunt into a fielder's choice, with Lowell erased at third. Things didn't look good when Alex Gonzalez struck out, but Youkilis saved the day. As for Papelbon's save (his seventh in seven tries), it certainly started well as he struck out Gathright. Carl Crawford singled up the middle, but the big righthander struck out Jorge Cantu. Then Travis Lee walked in a 10-pitch at-bat, and Jonny Gomes walked to load the bases. Stern had made a couple of eye-openers for Team Canada in the World Baseball Classic, but this was one of those all-or-nothing dives as he sped straight in on a sinking liner. ''To be honest," said Papelbon, ''I didn't think he caught it. I was looking at the umpire and he gave the out sign and I said 'Whew!' "
''That was a great play," said Terry Francona, ''and at the time of the game we needed it." Stern, whose 17-day Rule 5 obligation will be met today, might have saved his job for a while. ''I don't know," he shrugged. ''Whatever happens happens. ''In that situation, I'm playing 5-10 feet from the warning track. We're playing no doubles. As soon as it was hit, I knew I was all-in. ''That was cool with the game on the line. I just broke in and kept on running. That's just the way I play. You have to take chances to make plays." With the score tied at 2-2 in the seventh, Ramírez's single, a rising line drive, hit off the heel of Russell Branyan's glove. Two runs scored to give the Sox a 4-2 lead, but Mike Timlin couldn't hold that lead in the eighth after relieving Matt Clement, who allowed a leadoff walk to Lee to end his night. Timlin allowed a double to center by Gomes before Branyan doubled to right to tie the score. Give Timlin credit for at least keeping the game tied with Branyan on third and one out. Timlin retired Toby Hall and Tomas Perez to escape the inning at 4-4. The Sox trailed, 2-1, heading into the bottom of the seventh, but tied it on an unusual play. With Wily Mo Peña (walk, sacrifice, wild pitch) on third and Youkilis (walk) on first, Mark Loretta hit a line drive past the second baseman. While Peña scored, Youkilis held up, thinking the ball may be caught. He was cut down on a force play on the throw from right. With two outs, Ortiz smacked his second double off the Monster, sending Loretta to third, and setting up Ramírez for the go-ahead hit. With the game-time temperature 48 and dropping, Clement couldn't have been the easiest guy to face. In fact, the Devil Rays didn't score until the seventh when third baseman Ty Wigginton led off with a home run that just made it over the Green Monster, tying the score at 1. In the same inning, the Rays took the lead on back-to-back doubles by Hall and Perez. But the weird sight of the Ortiz shift on his first at-bat, and then variations when there were men on base, was intriguing to say the least. ''I didn't even notice it the first time," Ortiz said. ''If I were 0 for 20, I might have tried a bunt." With these two teams, we're surprised he didn't try it.